With the New Year comes the usual warnings from the various motoring organisations in the Country to take special care when driving. The reasons given for the vast number of road accidents that happen at this time of the year are many and varied—the main ones being ice, fog and drink. 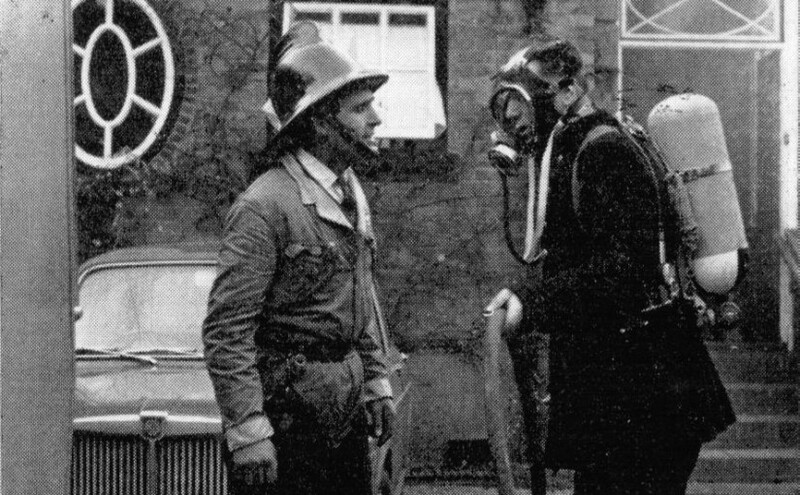 So much emphasis is put on road accidents being a modern day phenomena it is difficult to believe that even as far back as the early nineteen hundreds Rye had its fair share of traffic accidents. 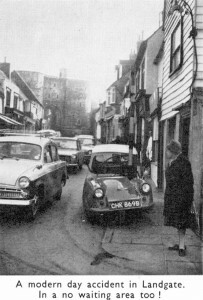 We do not know for sure when the first motor car graced the streets of Rye but a tale from that far off time illustrates the interest that the local people were taking in the development of the petrol engine. 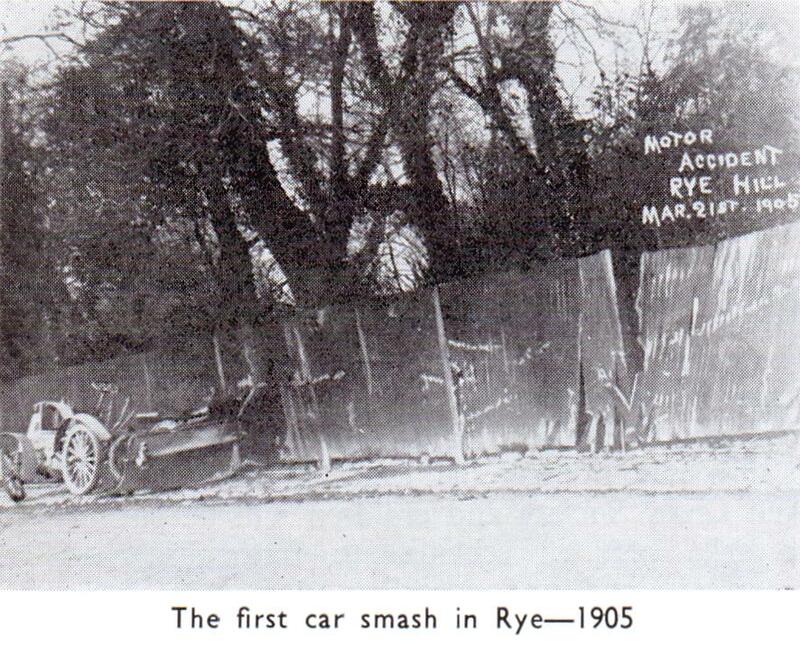 The First Car Smash in Rye? The first motor accident of any consequence in Rye was on 21 March, 1905. A nearly new Panhard 7 h.p. 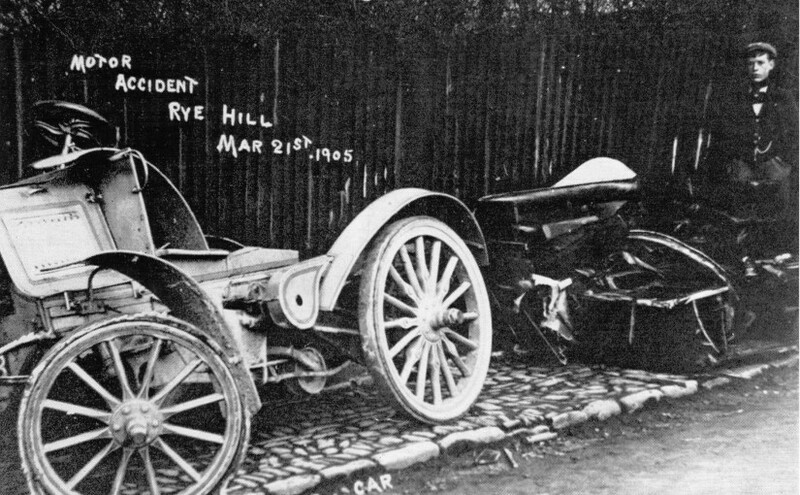 French motor car careered out of control down Rye Hill, crashing into the paling fence and eventually coming to rest on the pavement in a very sad state indeed, a complete wreck— fortunately no one was seriously hurt. 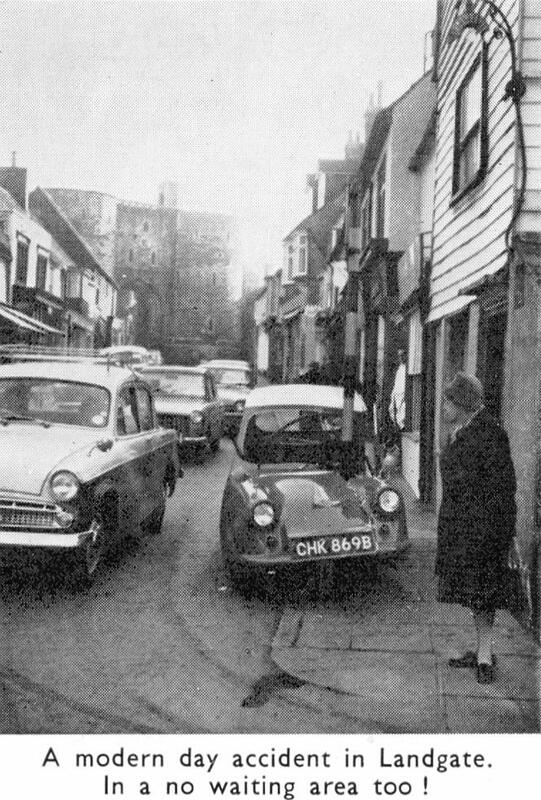 (This was published in the January 1966 issue of “Rye’s Own” – New facts about the accident soon emerged and we learned that Captain Oaks was killed in the crash) The photo­graph of this incident gives some idea of the speed at which the car must have been travelling. 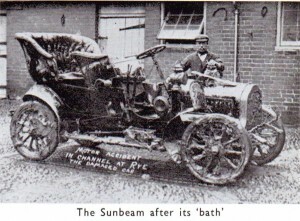 Note the solid tyres, one of which has been torn from the rim. 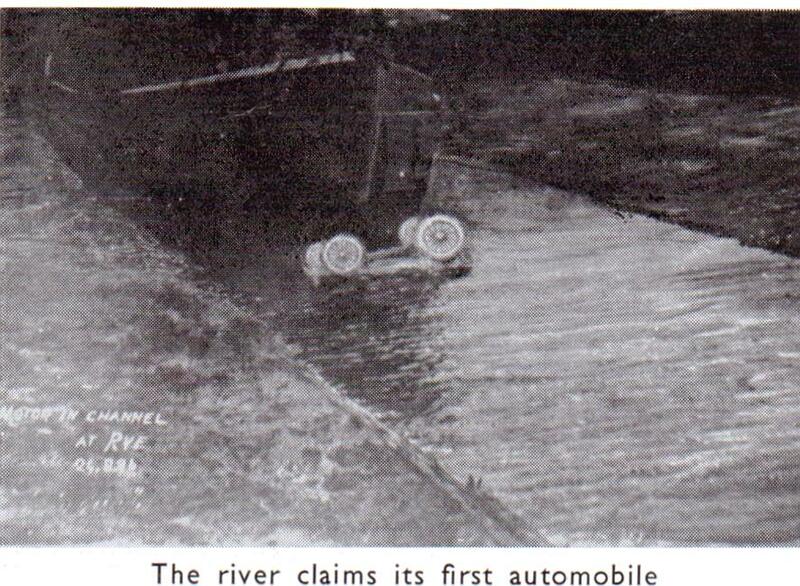 The other pictures are of an accident that has been repeated more than once since. A 1904 four cylinder Sunbeam ran into the channel at the Strand on the night of 24 August, 1906. Great effort was made to retrieve the wreck from the Channel and the other photograph shows the state of the car when it was eventually towed out the following day. 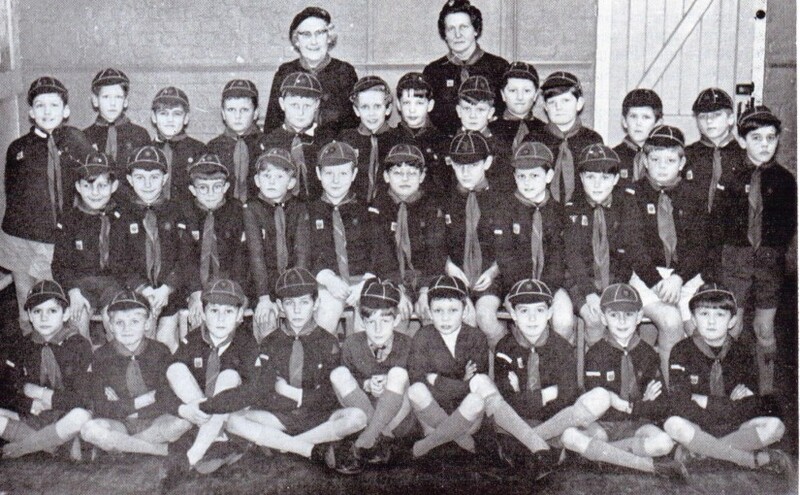 These are but two mishaps of the time, no doubt there are many others that have gone unrecorded or forgotten. 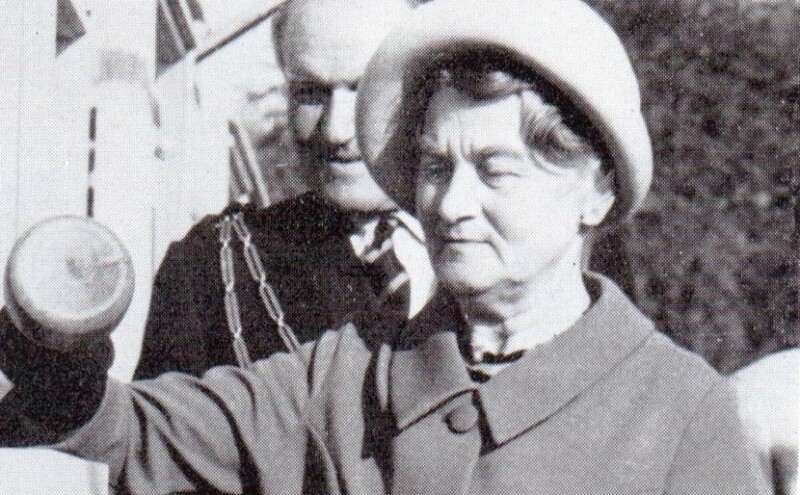 Motoring in those days was a far more exhilarating and adventurous affair than it is in these modern times. The driver really had to dress up for the occasion—a proper motoring jacket and of course the inevitable pair of goggles. The lady of his choice also had to take proper precautions. 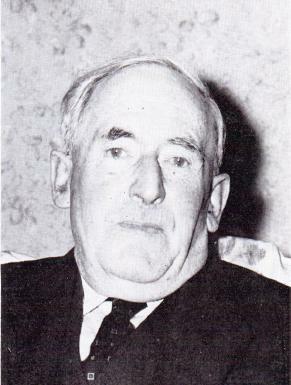 The enormous hats with ostrich feathers and all the trimmings of that age of fashion had to be tied with a gay scarf securely knotted under the chin. A days motoring was a very special occasion, with the wind whipping in the faces of the occupants and more often than not, the excercise of pushing on the very steep hills. Garages were very few and far between and journeys had to be planned carefully in advance and there was always the risk that the joy ride would end by walking home, this was not always the case though, as the owners of these temperamental machines were all good mechanics— they had to be, even to start them.